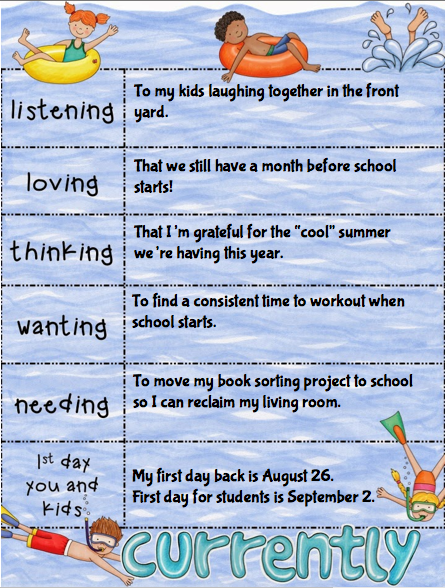 I'm linking up with Farley, from Oh Boy 4th Grade, for the August edition of Currently. Please stop by to visit Farley if you haven't already! Listening - I am truly grateful that my kids get a long most of the time. Time for them to play and just be kids is truly the best part of summer. Loving - In Michigan, we start school on September 2. I’m excited to start the new year with my students, especially since I’m looping with my students this year. But, I’m also grateful for this time to be with my own kids. Our schedule gets so crazy during the school year that I sometimes feel like my head might spin right off. This time to catch up, snuggle, exercise, take naps, read lots of books, play and ride our bikes is so refreshing. Thinking - It’s been a cool summer. You won’t find me complaining about it one bit. Just a few months ago, we had over two feet of snow on the ground and several days in row below 0 degrees. I love snow, but this winter was a bit much even for me. A cool summer is better than a horrible winter. Wanting - In the summer, I work out consistently. Then September rolls around and interferes with my workout schedule. Am I the only teacher/mom who ends up putting her workouts last on the to do list? At night, I’m a full time taxi driver (soccer, dance, baseball). Then there’s that school work after the kids go to bed... I WILL MAKE TIME FOR MY WORKOUTS...somehow. Needing - My summer book sorting projects are almost finished. I sorted chapter book series, the rest of my leveled library and my collection of mentor texts. Now, to return the mess to my classroom. First Day - I have a few presentations to do and a couple training days to attend in August, but our first official teacher day is August 26th. Open House is August 27th and the kids first day is September 2. Stop by to visit Farley to find out what everyone else is CURRENTLY doing! As always, thanks for hosting, Farley! Nothing better than hearing your children laughing! Have a great weekend- happy to have found your blog! I agree! It's been a pretty mild summer this year! I was very surprised when I checked the weather this morning that this week in Eastern NC will be in the upper 80's when we're usually well into the 90's. I'm not complaining though - my hair appreciates it!! Hope you have a great year! haha I loved reading your currently! We are having opposite summers it sounds like! It has been freakishly hot here in Oregon, which is NOT normal! I also am anxious about the school year and finding the balance between life and working out again! AND my library is also taking over my house! Good luck with everything this year! Oh goodness...I sure hope this winter isn't a repeat of last winter. I remember our Christmas break being extended by 3 days and by the time it was over, I was ready to go back just so I could leave the house! :) I too love that it's THE LAW that we can't start school until after Labor Day. Here's to a fun-filled August! I will be starting with my class on September 3rd...one day off of your start! It is crazy to think some people have already gone back. I am happy we have another month too! Enjoy it! I am happy to hear that your summer weather is tame compared to the winter you all had. I was born and raised in Michigan and remember plenty of hot and humid summer days. Enjoy the rest of your summer! !